I’m not a big fan of translated movie titles. I live in Sweden, and while it doesn’t happen that much nowadays, it used to be common practice to give foreign films a Swedish title. Granted, many original titles might be awkward or referencing something that might be obscure to the average Swede, so there are instances where it’s warranted. That doesn’t mean it isn’t annoying searching fervently for The Descent on my DVD shelves for a couple of minutes until I remember that it has the Swedish title Instängd (direct translation: Trapped) on the spine. Some Swedish titles work. They make sense, are catchy and stick in the public conciousness. Nobody calls Jaws by its original name here. It’s Hajen (The Shark). One Flew Over the Cuckoo’s Nest is known by the shortened Gökboet (The Cuckoo’s Nest), a term that has since entered our language to describe any place one might find maddening (our school cafeteria was named Gökboet, for instance, which says a lot about what the staff thought of us students). On the other hand, some translated titles are never used even if they’re not terrible. The first Star Wars movie is officially titled Stjärnornas krig (War of the Stars) here, but good luck finding anyone who calls it that. Anyone below retirement age, that is. Theme naming films based on the people involved used to happen somewhat regularly. The best example is arguably Mel Brook‘s filmography. I assume the sentiment was that The Producers was kind of a dull name that translated or not wouldn’t really indicate comedy. 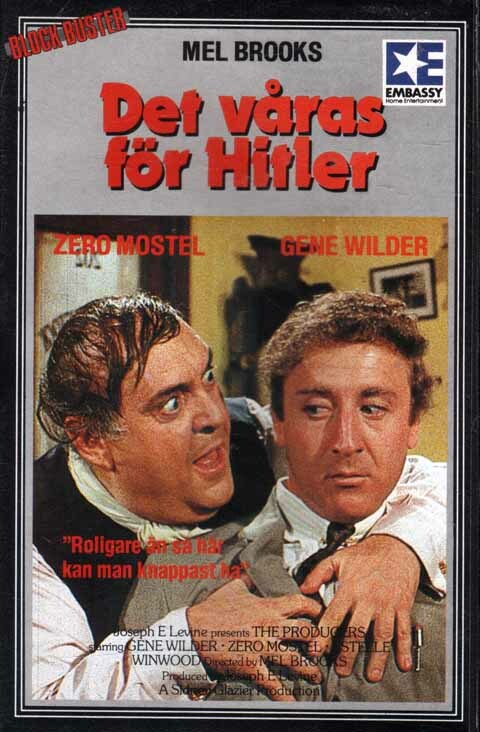 The movie was retitled after the play-within-the-film, Det våras för Hitler (Springtime for Hitler). Fair enough, but then they took the Springtime ball and ran with it. The Twelve Chairs became Det våras för svärmor (Springtime for Mother-in-law). Blazing Saddles became Det våras för sheriffen (Springtime for the Sheriff). After that, we got springtimes for Frankenstein, the silent movie, the psychos, the history of the world, Hamlet, space and the slums. The streak was finally broken with Robin Hood: Men in Tights, which got the direct translation Robin Hood: Karlar i trikåer. Another example of this kind of theme naming sprung up around Goldie Hawn. After her 1978 movie Foul Play became a hit in Sweden with the name Tjejen som visste för mycket (The Girl Who Knew Too Much), a lot of movies starring her during the 80s got The Girl Who [x] titles. More misleading are the film collaborations of Michael Douglas, Kathless Turner and Danny DeVito. Adventure flick Romancing the Stone got the title Den vilda jakten på stenen (The Crazy Hunt for the Stone), which isn’t a bad name, all things considered. And that its sequel Jewel of the Nile then became Den vilda jakten på juvelen (The Crazy Hunt for the Jewel) is also acceptable. But then the unrelated black comedy War of the Roses arrived with the same main players, and it became Den vilda jakten på lyckan (The Crazy Hunt for the Happiness) here in Sweden. From what I’ve read, theater-goers in the US were quite thrown off by the film’s dark tone, expecting it to be similar to the trio’s earlier light-hearted fare. I imagine the problem was magnified over here at the time. Perhaps the crown jewel of bad Swedish movie titles is It Could Happen To You. Remember what that film is about? No? It’s about a policeman who gives a waitress 2 million dollars in tip through a lottery ticket. If you were Swedish, there’s no way you’d forget. It’s name over here is Polis ger servitris 2 miljoner i dricks (Policeman Gives Waitress 2 Millions in Tips). According to IMDB, this was the working title for the movie when it was in production. Before someone realized it was a terrible name, I assume. Shame they didn’t tell us. Every now and then, distributors and translators get a bit too creative. They’re seized by some spark of mad inspiration, resulting in some rather unusual new names for various films. The great movie Swingers got hit bad, arriving in the aftermath of a fairly memetic local commercial for chips. It was thus nonsensically named after a line from said commercial: Du, var är brudarna? (Hey, Where are the Chicks at?). Sometimes, the translators want to use a catchy rhyme. Winona Ryder‘s 1989 film Heathers became Häxor, läxor och dödliga lektioner (Witches, Homework and Deadly Classes), for instance. There’s also Jay & Silent Bob Srike Back, which ended up becoming Stjärnor utan hjärnor (Stars Without Brains). And sometimes they go for weak puns. Take Grosse Point Blank, for instance. The Swedish title is the unwieldly Även en lönnmördare behöver en träff ibland (Even an Assassin Needs a Date Every Now and Then), playing on the word “träff” which can mean both “date” and “hit”. How about this title: Bleka dödens minut (Pale Death’s Minute). What kind of images does a name like that conjure up for you? Maybe a horror film? Maybe some heavy melodrama? Well, you’d be wrong. It’s The Princess Bride. Another one that seems particularly reviled on Swedish movie forums is Sergio Leone‘s highly beloved Once Upon a Time in the West. Swedish title: Harmonica – en hämnare (Harmonica – An Avenger). Buster Keaton‘s films have also spawned some interesting new titles. Apparently, the translators liked to pick three nouns and just slap them together. Our Hospitality became Krut, kulor och kärlek (Gunpowder, Bullets and Love), Sherlock Jr. oddly turned into alliterative Fart, flickor och faror (Speed, Girls and Hazards), and College ended up as punny Rodd, hopp och kärlek (Rowing, Hope and Love). 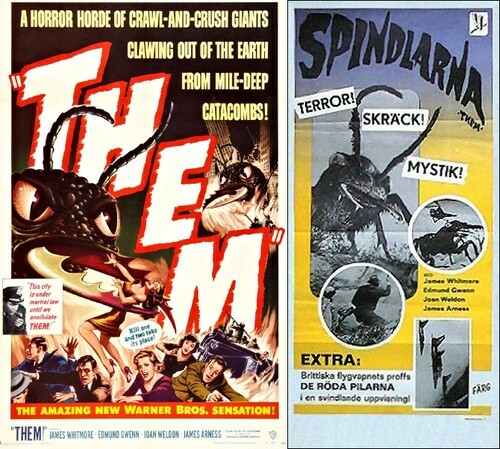 My favorite, however, might have to be the 1954 monster movie Them!. Something of a landmark in science fiction films, it’s about giant mutated bugs wrecking havoc. While the original title is catchy and memorable, it doesn’t really translate well directly to my native language (“Dom!” would just look really weird to my eyes). So some rethinking was in order, and it ended up with the somewhat generic title Spindlarna (The Spiders). Not very imaginative, of course, but I suppose it works fairly… Wait, what’s that, you say? There are no spiders anywhere in the film? The giant bugs are actually ants? Oh. Posted by Emil on 21 July, 2011 in Misc. Great article very well summed up. Some really great ones! Having watched The Princess Bride yesterday, that translation really suprised me, doesn’t seem to have anything to do with the movie. “Bleka dödens minut” is quite the headscratcher, I agree. It really has nothing to do with what goes on in the film, and even worse, it doesn’t even convey a sense of what kind of film it is. The film doesn’t have anywhere near the cult status here in Sweden as it does in the US, and I’d like to think the horrible title has something to do with it. Maybe I have the wrong idea of the film’s status. I often tend to come across it when people discuss childhood favorites, and it’s certainly quite quotable. I very much liked the film myself, for what it’s worth.